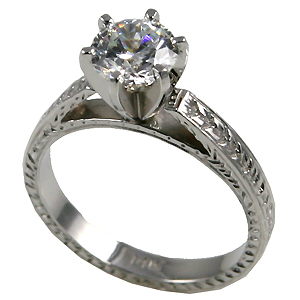 Stock #552798:1 carat Antique Style Engraved Cathedral Solitaire/Engagement ring in Solid 14k White Gold ... Gorgeous hand-made piece!!! Beautiful, Hand-Crafted, top quality Jewelry workmanship!!! Can be special ordered with any shape/size of center stone.